Minutes ago, the City Council unanimously passed a bill that would levy civil penalties against hit-and-run drivers. Fines start at $500, increasing to $2,000 for drivers who leave injured victims and $10,000 for drivers who cause serious injury or death. The bill now goes to Mayor Bill de Blasio, who is expected to sign it. The bill does not include criminal penalties. Currently, the state classifies most hit-and-run crashes as misdemeanors, not felonies. This creates a perverse incentive for drunk drivers, who can avoid a felony conviction if they flee the scene and get tagged with a lesser hit-and-run charge instead. Today’s City Council bill aims to reduce the incentive to flee the scene, but it’s up to Albany to reform state law. For years, a bill to upgrade hit-and-run to an automatic class E felony has passed the Senate but failed in the Assembly. The bill could be hamstrung by language requiring that a driver must know or have cause to know that he caused property damage, injury, or death before penalties can be assessed. In these situations, a driver’s word that he or she didn’t see the victim could let them off the hook. The bill also hinges on NYPD’s ability to catch hit-and-run drivers in the first place. Of 60 fatal hit-and-run crashes investigated in 2012, NYPD arrested just 15 drivers, according to Transportation Alternatives. Last month, cyclist Dulcie Canton was struck by a hit-and-run driver in Bushwick. Although she collected evidence leading to a suspect, the detective assigned to the case refused to act on it. Today, Rodriguez and Van Bramer cited hit-and-run fatalities where these penalties would have applied. 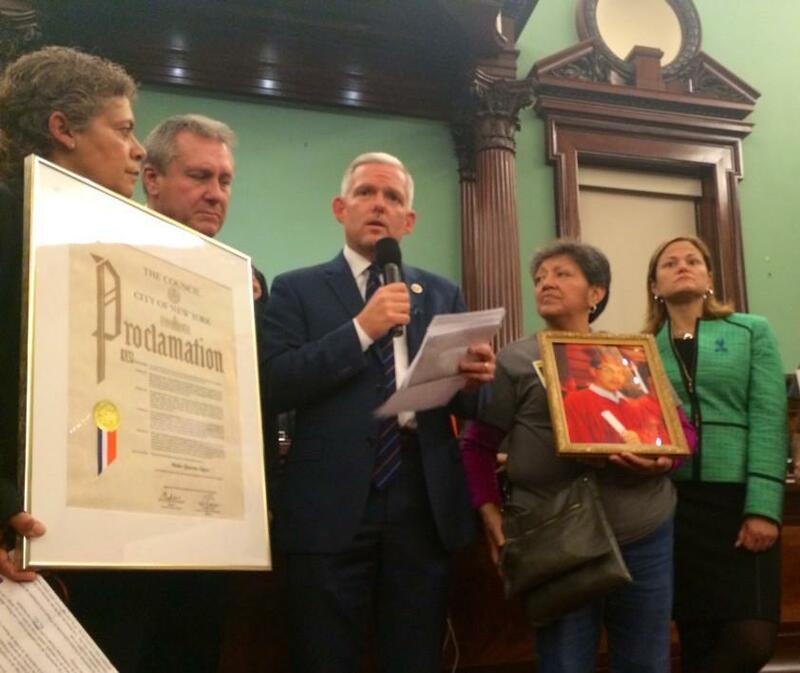 Martha Puruncajas, whose son Luis Bravo was killed by a hit-and-run driver in Van Bramer’s district last year, joined the council member and other advocates from Make Queens Safer on the floor of the City Council this afternoon to receive a proclamation honoring their work. Great that Ydanis is pushing for this. We need something much stronger to pass through Albany. The law needs to be changed since now it incentives a drunk driver to flee a crime and lie about knowing about it. That’s not what our Founding Fathers set up our government to do. When Will Albany Act to Strengthen Hit-and-Run Penalties? Ydanis Rodriguez and other Upper Manhattan electeds joined friends and family of Jean Paul Guerrero yesterday to urge lawmakers to reform state law that incentivizes deadly hit-and-run crashes. Will Meaningful Hit-and-Run Reform Be on Albany’s 2016 Agenda? Ydanis Rodriguez wants to create an Amber Alert-type system for nabbing hit-and-run drivers, and a growing number of legislators are signing on to the idea.